The fashion accessory is also a tactile tool. The mala—a traditional garland made of prayer beads—is much more than a bohemian fashion staple. It can also aid you in your meditation practice, says Jessica Stickler, a New York City-based yoga instructor at Equinox. She first learned to use the mala while training to become a Jivamukti yoga teacher about a decade ago. Though it's a centuries-old custom, Sarah Girard, a yoga instructor at Equinox in New York City, has noticed an uptick in interest lately. “People are looking for a tangible way to bring their mindfulness practice to life,” she says. 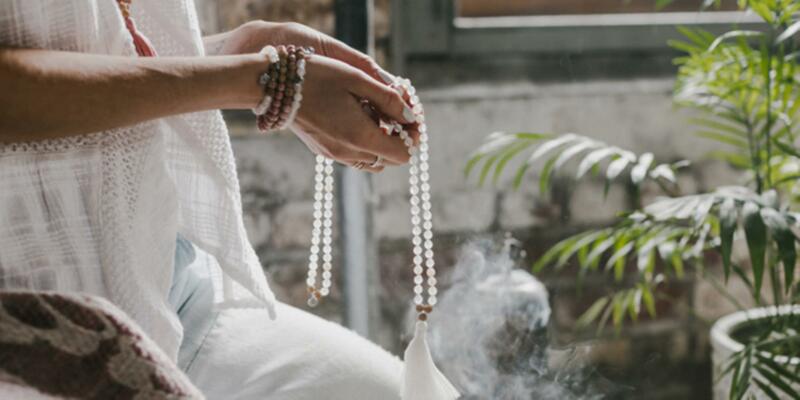 “Given the interest in crystals and stones that's emerging through social media, mala beads are a wonderful way for people to connect with nature and drop into the present moment." Here’s what you need to know about the accessory and how you can use it in your daily practice. The type and number of beads matter. Jemma Sands, an avid yogi and jeweler in Los Angeles, crafts her malas out of healing crystals and gemstones with specific energies and properties. “Traditionally, they’re made from rudraksha beads, lotus seed beads, bodhi seed beads, or wood,” she says. The materials themselves have unique meanings. Tulsi wood, which comes from the tulsi or holy basil plant, is preferred by Hindus because they use it to connect to their various gods. Rosewood is believed to shield one from negative energy and is also known for manifesting what you desire, dream, and need to heal. Bodhi wood is darker in color and a favorite of Buddhists, since it comes from the famous tree that Buddha sat under when he received enlightenment. But the most important characteristic of the necklace is that there are 108 beads. “It’s a multiple of nine, which is considered to be a whole, infinite number,” Stickler says. The significance of the number is open to interpretation. Sands learned from a meditation teacher that there are 108 energy pathways in the body, which all connect to the heart, and that the mala beads help align them. Tucked between all the others is one bead that’s unique from the rest: the guru bead. Always with a characteristic that makes it distinct (it could be a different shape or made from a different material than the rest), it's often positioned next to the necklace’s tassel, Sands says. The tassel is important if you're stringing your own beads because it anchors the mala’s stringing cord at the end of the guru bead and hides the end knot. The color can correspond with chakras or chromotherapy. You can use them to enhance your practice. “Sometimes when you’re trying to meditate, your mind starts to drift off,” says Lia Montelongo, a vinyasa yoga instructor at Equinox Santa Monica. The mala is a tactile tool that, when used appropriately, helps you relax and increases mindfulness. When handling the mala in meditation, move each bead with the thumb and the middle finger, starting at the one next to the guru bead. Don’t use your pointer finger, which signifies the ego. “Every time you move to the next bead, it resets the intention,” Montelongo says. When you get to the guru bead, flip it around and start moving in the other direction. If you’re on the go or don’t have time for a formal meditation practice, mala beads can still act as a reminder to pay attention to your breathing and mindset. Montelongo wears hers, given to her by her guru when she graduated from yoga training, every day to help her stay present. They’re easy to bring in your pocket, wrap around your wrist, or throw in your carry-on. Mantras can make them even more meaningful. To pair your mantra with the mala, repeat it as you handle each bead. “In some traditions, the mala is a way to count or track the mantras,” says Stickler. Keep the body still and focus on the movement of breath or the pace of your recitations. In turn, “the breath, heartbeat, and natural rhythms of the body slow,” she adds, resulting in a heightened state of awareness and relaxation—exactly what the best meditation sessions should do. A deceptively simple yet profound mantra from the Jivamukti tradition is "let go," she says. But don’t stress about finding the perfect one. You can freestyle or borrow from any practice. The four malas below use materials with specific meanings and purposes. Made with ethereal crystals like pearls and moonstone along with grounding stones like hematite and black onyx, this mala is designed for new beginnings and transformation. For women it’s also believed to help harmonize your cycle with the moon’s phases. This hand-knotted design features natural wood beads rather than heavyweight gemstones. With a dash of peony extract and heart-healing rose quartz, it’s ideal for those who are working on relationships, healing, or self-love. In the world of healing crystals, this type of quartz is designed to help banish negativity. In this mala, the stone is used in conjunction with rudraksha seeds, which promote inner peace and calm. They darken over time as they absorb the body’s oils. The goal of asanas and pranayama is to align the body’s seven chakras, and this mala necklace has the same intention. It’s made with healing crystals for each chakra and you have the option to customize it with your favorite mantra.